Philip Reed, “Philip Reed,” Histories of the National Mall, accessed April 23, 2019, http://mallhistory.org/items/show/485. Philip Reed was an enslaved man who worked in the foundry operated by his owner, Clark Mills. The foundry cast the statues of Andrew Jackson in Lafayette Square and the statue of "Freedom" which tops the Capitol dome. The plaster cast for "Freedom" was designed in Italy by artist Thomas Crawford, and shipped to the Capitol. When time came to move the plaster model to the Mills foundry to finish the sculpture, Reed cleverly devised a way to safely separate the five pieces for transportation. As an eslaved person, Reed could receive pay directly for work he did on Sundays. Records show he worked 33 Sundays in 1860-61 on "Freedom." Architect of the Capitol. View original document. Philip Reed was probably born in South Carolina around 1820. By 1840, he was living near Washington, DC, with his owner, Clark Mills. Reid worked in Mills's foundary during that time. 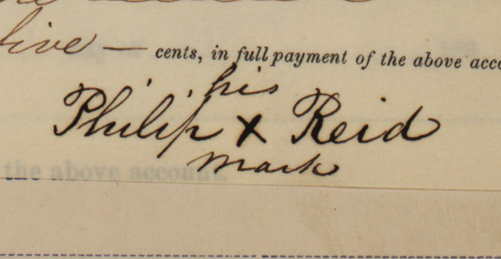 Although his name is spelled Reid in documents from when he was a slave, Philip used the spelling Reed as a freedman. By 1865, Reed worked as a plasterer in Washington and later married. He was buried in Graceland Cemetery, but disinterred twice with the other occupants of that cemetery, as the city expanded. His remains are now housed at National Harmony Memory Park, where there is memorial plaque in his honor.